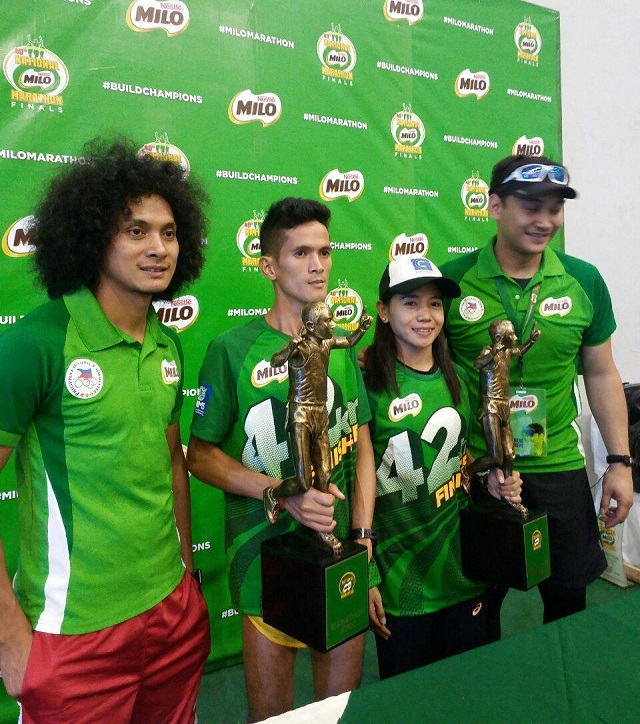 Mary Joy Tabal won her fourth consecutive MILO Marathon Queen crown and Jeson Agravante won his first MILO Marathon King title at the 40th National MILO Marathon National Finals on Sunday, December 4. Over 17,200 runners enjoyed the festive atmosphere, scenic route and very good weather. This was also the biggest race in Iloilo to date, a record fitting to mark the 40th anniversary milestone of the National MILO Marathon. Olympian and SEA Games silver medalist Tabal broke her own record by posting her time of 2:47:49, enabling her to win a special prize of an additional PHP 50,000. Following Tabal were Christabel Martes (03:10:11) in second place and Lizane Abella (03:14:27) in third. Meanwhile, Agravante posted a time of 02:35:13, besting his closest rivals Maclin Sadia (02:35:22) and Julius Sermonia (02:37:01) who came in second and third, respectively. The National Milo Marathon is not only a breeding ground for local talents but also a program that empowers children nationwide. For the past six years, the National Milo Marathon’s Help Give Shoes advocacy, in partnership with the Department of Education, has inspired 60,000 aspiring athletes to fulfill their dreams by donating brand new pairs of running shoes. This year, the Help Give Shoes advocacy will be donating 10,000 pairs to underprivileged school children. In 2017, the 41st National MILO Marathon will kick off in Urdaneta on July 16, followed by races in Laoag (July 23), Pasay (July 30), Angeles (August 6), Tarlac (August 13), Antipolo (August 20), Naga (August 27), Lucena (September 3), Lipa (September 10), Imus (September 17), Tacloban (September 24), Roxas (October 1), Iloilo (October 8), General Santos (October 29), Davao (November 5), Butuan (November 12), and Cagayan De Oro (November 19). The National Finals will be held in Cebu on December 3.